With the holidays coming up and Thanksgiving being this week, I thought about what YOUR Boise Hawks are thankful for, their host families! A lot of players come into a new city for their minor league team and are expected to find their own housing. For instance, the team I used to work for would place their players in a hotel for I believe three or four days and were then expected to take over the payments at the hotel, find a family to live with or find an apartment/house for rent. There was a booster club, but no host family program. The host family program is one thing that the Chicago Cubs really appreciate as an organization. 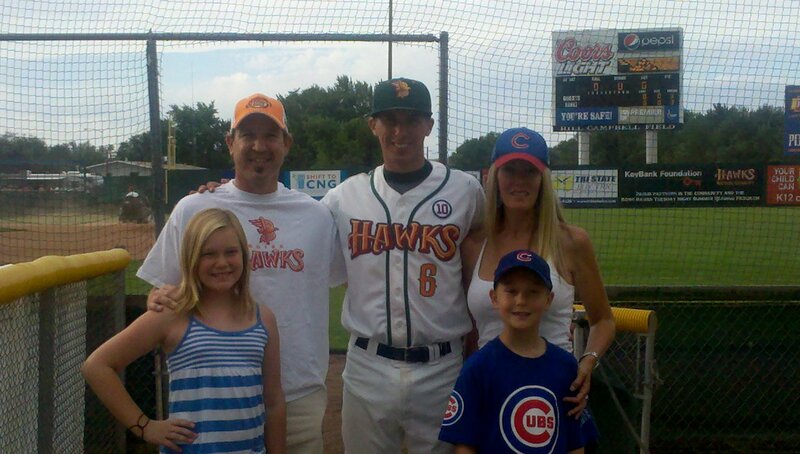 The host family program here at YOUR Boise Hawks lifts a lot of weight off of the player’s shoulders. When the players arrive they meet the host families, listen to their arguments for why they are the best family to live with listing things such as their children, animals, and the fact that they have a pool or hot tub and will provide a car, and then the players get to choose which family they would like to live with. I talked to Jeanette Kirkpatrick, the new Host Family Coordinator for 2013, to find out what the program means to her and her family. The Kirkpatrick’s are a baseball family! “We love baseball.” They have had the opportunity to host four future Cubs and have loved every minute of it. “Our first year we hosted Brad Zapenas who was a really great player, friend, and “summer son”. We were very lucky and got to have Brad all summer and developed a special connection with him.” This year they weren’t as lucky with having just one “summer son” for the entire season, however, they were very lucky in the fact that they got to spread their time across three Boise Hawks. “We had the privilege of hosting Chadd Krist, catcher, Matt Iannazzo, pitcher and Brian Smith, pitcher. Getting the call late at night while the Hawks were on the road that Chadd had moved up was so bittersweet. We were all just getting to know him and were very sad to see him go, but at the same time, we were so extremely happy for him and his success. Then we got Matt and it happened again!” The Kirkpatrick’s ended the 2012 season with Smith who fit perfectly into their family for the last few weeks of the season. “We are most excited to meet and get to know the new players and also see some of our old players. We have cultivated some amazing new friendships and bonds that extend past the summer.” As you can see from reading this article, the host family program can be a very exciting and enlightening experience for your family. The program is always searching for interested families and should be in contact with Jeanette Kirkpatrick for more information or visit www.BoiseHawks.com. A few of YOUR Boise Hawks decided to share what they were most thankful for when it came to their individual host families in 2012.